The name Imp Crab is short for Impressionistic Sand Crab and is intended to imitate the Pacific mole crab or sand crab. 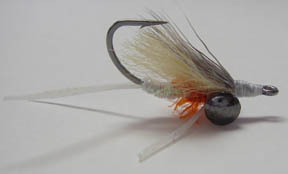 This impressionistic design appears to work much better than many realistic looking flies. Tie the machined brass eyes under the hook about a third of a shank length back from the eye allowing the fly to ride with its point up. Fold a four inch piece of Sili Legs in half and lay it on top of the hook behind the brass eyes and tie it in with a loop about a quarter inch sticking up (later to be cut to form legs). Wind the thread back, tying the Sili Legs down to the bend of the hook leaving the antennae sticking out the back of the hook. Tie in a piece of Diamond Braid at the bend with the waste end lying on the hook to the brass eyes. The first winds of thread must be very tight. Wind the Diamond Braid forward to a point about an eighth inch short of the brass eyes and tie off and clip. Tie in the Petite Estaz and tie off and clip the material. This fly obviously is intended to represent the female crab if the females carry the roe. Flip the fly over (hook point up) in the vise or rotate the vise head if you are using a rotary vise. 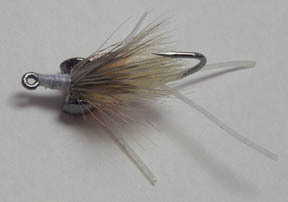 Tie a small bunch of craft fur and clip so it extends just to the bend of the hook. Stack and tie a small bunch of deer hair in over the craft fur with its length about the same. Whip a tapered head. Clip the loop of Sili Legs and maneuver each so they appear to be oversized legs.